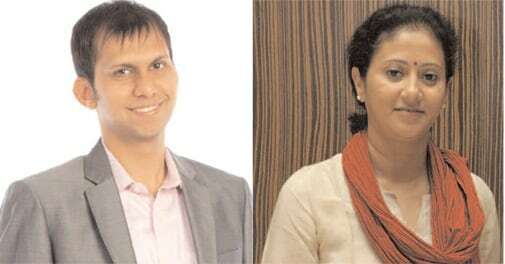 Vijay Bharech(L), deputy manager and Tapati Ghose(R), partner at Deloitte Haskins & Sells LLP. The Finance Minister had a daunting task of drawing a roadmap for higher growth with fiscal prudence, lower inflation and manageable current deficit. Accepting the challenge of maintaining the fiscal deficit at 4.1 per cent for the financial year 2014-15, a budgetary framework has been cast - amendments made on the personal tax front reflect the overall objective of fiscal prudence. >> The personal income tax exemption limit has been increased by Rs 50,000 from Rs 2 Lakh to Rs 2.5 Lakh in case of individual tax payers who are below the age of 60 years. A corresponding increase has been made in the case of senior citizens with an increased exemption limit from Rs 2.5 lakh to Rs 3 lakh. >> The economy has seen a significant reduction in domestic savings. To encourage households to generate much needed savings, the budget has proposed the limit under Section 80C to be raised from Rs 1 lakh to Rs 1.5 lakh to encourage domestic investment in long term savings. Consequentially, for those wishing to save more under Public Provident Fund (PPF), the investment limit has been increased from Rs 1 Lakh to Rs 1.5 Lakh. >> Rising cost of financing a house has been a concern for the common people. To reduce this burden, the budget has proposed to increase the deduction limit on account of interest on loan in respect of self-occupied house property from Rs 1.5 lakh to Rs 2 lakh. The existing relief of Rs 2,000 available to marginal taxpayers, whose income does not exceed Rs 5 lakh, has not been dispensed with. Similarly, Rajiv Gandhi Equity Saving Scheme (RGESS) has not been closed and still continues as an additional tool for investments and saving tax for first time investors in equity markets. Widening the tax base to mobilise additional resources and cap leakages in revenue is the need of the hour. Some further steps have been taken towards this. At present, capital gains arising on transfer of mutual fund units, other than equity-oriented funds which are held for more than a year may be taxed at a concessional rate of 10 per cent at the option of the individual. Alternatively, he can choose to be taxed at 20% with indexation benefit. The FM has raised a concern that this allows tax arbitrage opportunity because direct investments in banks and other debt instruments attract a higher rate of tax. With a view to remove this tax arbitrage, the Finance Bill has proposed to increase tax rate on long term capital gains from 10% to 20% on transfer of units of such funds. Further, the period of holding to qualify as long-term in respect of such units and unlisted securities and shares has been extended from 12 months to 36 months. As a result, instruments like fixed maturity plans and debt mutual funds may lose their sheen. Those holding shares of companies not listed in India and have plans to sell before three years may be at a disadvantage. Considering this amendment is proposed to be effective from FY 2014-15, transactions from 1 April 2014 are likely to be impacted. However, for non-residents, the option of being taxed at 10% on sale of unlisted securities will continue to be available. The rollover provisions for claiming tax exemption from capital gains tax on sale of residential property and other long-term capital asset have been, in the past, interpreted to apply even if investment is made in multiple house properties or properties situated outside India. However, the Bill proposes to restrict this benefit only for investment in one house property that, too, situated in India. Currently, a taxpayer can invest capital gain arising from the transfer of a long-term capital asset in specified bonds within a six months. The limit for investment during a financial year is Rs 50 lakh. As a result, it is possible that capital gain arising after September is invested in two tranches of Rs 50 Lakh each over two financial years. This resulted in the claim for relief of Rs 1 crore as against the intended limit for relief of Rs 50 lakh. This being not the intent of the law, the ambiguity has been put to rest. It is proposed that the maximum exemption from capital gains tax on account of investment in specified bonds made during the financial year in which asset is transferred and in subsequent financial year will be capped at Rs 50 lakh in aggregate for all transferred assets. Since these changes are proposed to be effective from 1 April 2014, taxpayers who have carried out such transactions between April and July 2014 may be severely impacted. In his budget speech, the FM has committed to provide a stable and predictable taxation regime. In this regard, the facility of applying to Authority for Advance Ruling (AAR) for a confirmed tax position has been extended to resident taxpayers in respect of their income tax liability. The facility will be available only if the prescribed threshold is exceeded. Additional benches of the AAR will be set up. Additional Aykar Seva Kendras (ASK) would be instituted to improve service delivery. The maiden budget of this Government, drafted within a few weeks, is a mode to give direction stressing on the 5 Ts - Talent, Tradition, Tourism, Trade and Technology - a term coined by Prime Minister Narendra Modi to build Brand India. Vijay Bharech is deputy manager and Tapati Ghose, partner at Deloitte Haskins & Sells LLP.